I'm so excited to share this post with you all because it was the first one where my husband and I collaborated to come up with a list of things guys are sure to love. Since it's my first year living with a man, I thought it would be cool to pick his brain a bit (get some ideas for myself in the future...) and categorize the appropriate gift depending on what kind of guy you're buying for. Below you will find a wide range of potential presents that have been selected based off of the newest model (or most reliable) products we could find. You can find the description of each as well as the link to buy below the collage. Happy buying! For those who are up-to-date with the newest fashion trends and are constantly trying to look their best, here are some gifts that are necessities for any guy's closet. I am loving the grey blazer because it can be dressed up or down. The sunglasses have been the go-to in men's style for quite some time and look at that WATCH! So if any of your guy's are like mine, then they love family and friend get togethers. This section was created particularly for guy's like them. I'm going to ahead and highlight the Omaha Steak membership because my dad has one and they WILL NOT regret it. Also, how cool is that grill/cooler set? 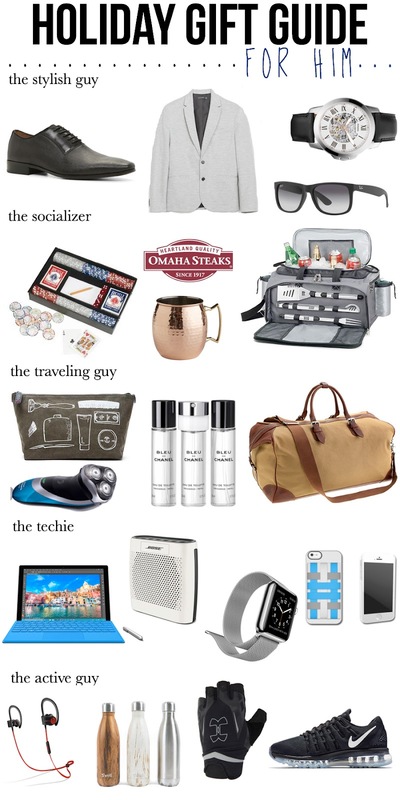 Some men are constantly on-the-go, whether it be for work or to satisfy their travel itch. Again, H is rarely prepared when he goes on a business trip so we hand selected some gifts that would solve the stress of remembering what to pack. The easiest section to come up with-- H knows all of the latest (& greatest) things for techies. Some of them might come with a hefty price tag, but they have all been approved to be totally worth it. PS: H has the Felix HoldTight and swears by it.